Israel and Palestine are, by international criteria, water scarce. As the peace process continues amidst ongoing violence, water remains a political and environmental issue. Thirty leading Palestinian and Israeli activists, water scientists, politicians, and others met and worked together to develop a future vision for the sustainable shared management of water resources that is presented in Water Wisdom. 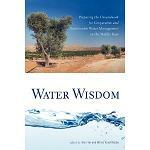 Their essays explore the full range of scientific, political, social, and economic issues related to water use in the region ; acknowledge areas of continuing controversy, from access rights to the Mountain Aquifer to utilization of waters from the Jordan River ; and identify areas of agreement, disagreement, and options for resolution. Water Wisdom is model for those who believe that water conflict can be an opportunity for cooperation rather than violence.